Thanksgiving Packet by Colleen Gallagher - Printables for Turkey Day! For single classroom use only! Printables found in this packet may only be used by the purchaser and may not be resold in any form. All printables come in a zip folder. All the files are in PDF format. 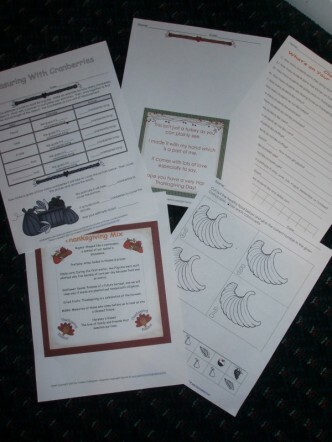 Over 25 pages of Thanksgiving hands-on printables. 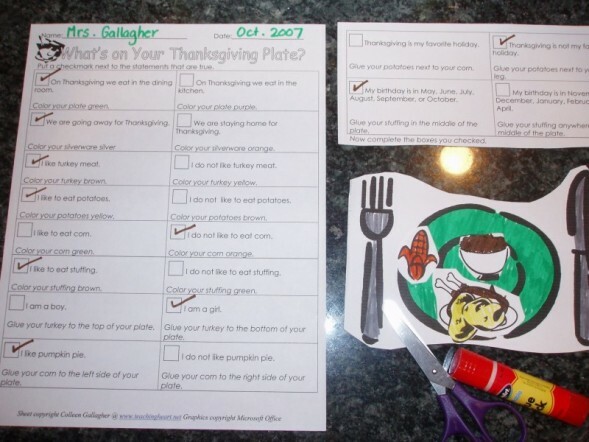 Just print, laminate, and cut these pages and you have a week or more of Thanksgiving activities that meet standards and put a smile on your students faces. 1.) 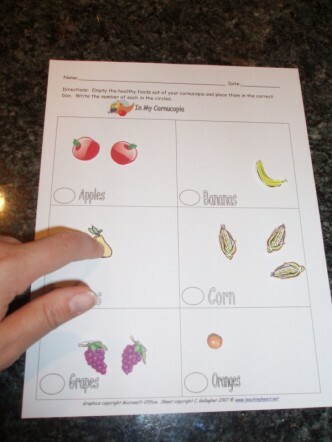 Making Estimates and Measuring Length and Area With Cranberries (1-3)  Students work in teams to complete this activity sheet. Teacher supplies each team with a cup full of cranberries. 3.) 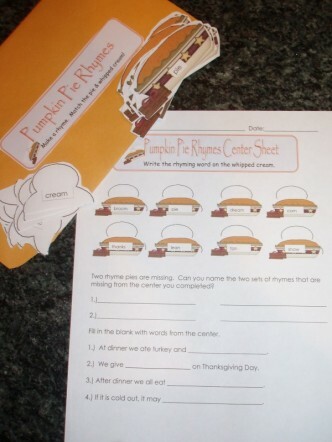 Pumpkin Pie Rhyme Take It To Your Seat Center  Teacher places given manipulatives in an envelope. Student takes envelope to their desk and matches the pie to the cream by using rhyming pairs. A matching center sheet is included. The student completes the sheet as they work on the center. (K-2) The center sheet can be completed independently by second graders. K & 1 will need assistance. 5.) Graphing For Thanksgiving - Print pages 1 -2 on separate sheets of paper. 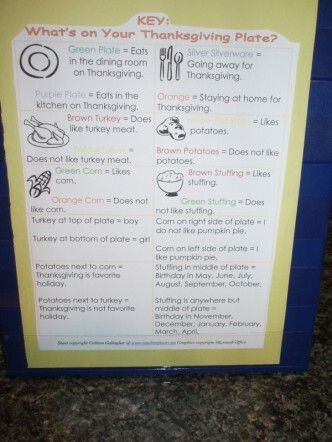 Cut out a few of the Thanksgiving pictures and show your students how to place them on the graph. Then, allow them to complete the rest. When they are finished, instruct them to complete the graph questions. 8.) 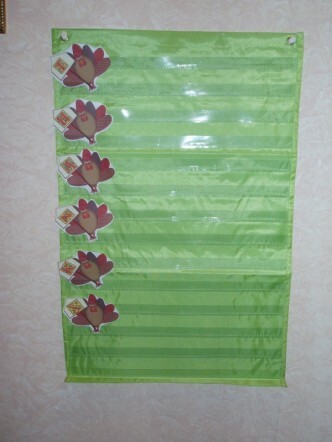 Thanksgiving Trail Mix Bag Tag  Attach this tag to a Thanksgiving mix and you have a great Harvest treat for your students and/or your friends. 12.) There Was an Old Lady Who Swallowed a Pie Activities - Five pages of activities. Old Lady Baggies, Old Lady Sequence, Old Lady Spinner, Old Lady Graphing, Old Lady Dice Game!!! 13.) 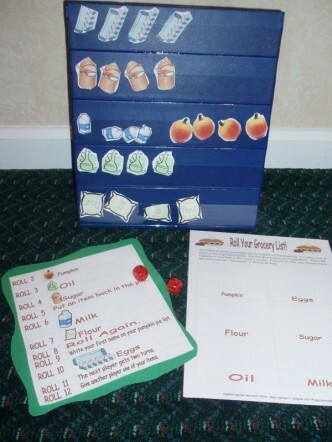 Make Thanksgiving Word Problem Dice for Multiplication and/or Addition Story Problems - Includes a center sheet to record student rolls. $12.99 - All Files come zipped in PDF. Some files are in Word or Publisher as well. 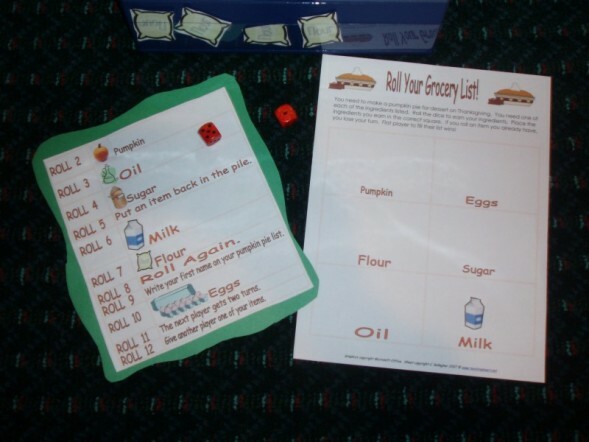 Roll a Grocery List To Make a Pumpkin Pie - Students take turns rolling the dice and completing the task as directed by the given key (page1) First player to fill their playing card (page 3) with one of each pumpkin pie ingredients (page 2) wins.(1-3). I use a small pocket chart as the store. When the students roll, they take the item from the chart and put it on their list. This makes a great center or a fun activity for free time! 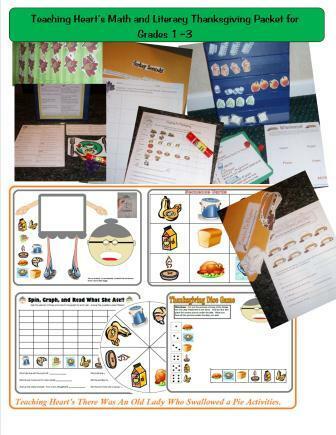 Thanksgiving Plate Glyph Activities  Includes manipulates to make the glyph, printable glyph key, and a classroom activity sheet for analyzing glyph data. (1-3) First the students answer questions about Thanksgiving in their family. Then they color and cut the glyph based on their answers. After the glyphs are done I suggest you display them along with the key. Then the display can become even more fun with learning. The students can fill out a sheet that asks questions about all the glyphs. 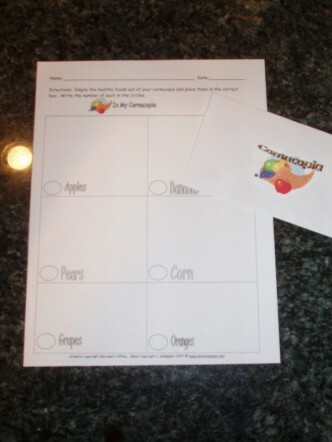 Cornucopia Activities  Six pages of fun cornucopia activities. Background information for the teacher, graphing activity with manipulatives, sorting activity, and a counting activity. (k-2). 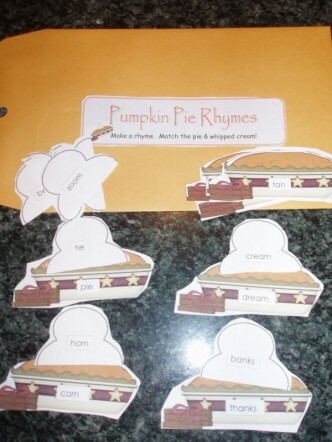 Pumpkin Pie Rhyme Take It To Your Seat Center  Teacher places given manipulatives in an envelope. 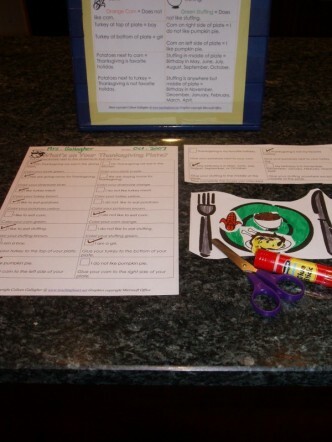 Student takes envelope to their desk and matches the pie to the cream by using rhyming pairs. A matching center sheet is included. The student completes the sheet as they work on the center. (1-3) The center sheet can be completed independently by second graders. First graders will need assistance. 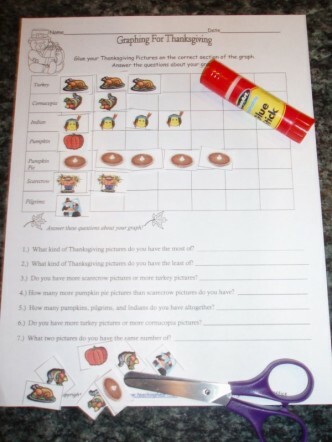 Graphing For Thanksgiving - Print pages 1 -2 on separate sheets of paper. 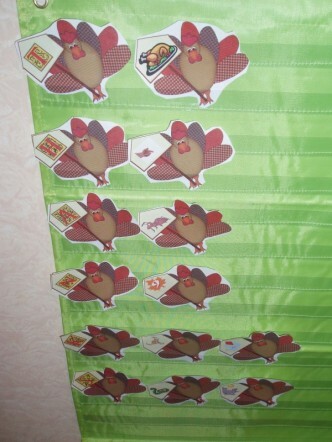 Cut out a few of the Thanksgiving pictures and show your students how to place them on the graph. Then, allow them to complete the rest. When they are finished, instruct them to complete the graph questions. CLICK TO Read our copyright and terms of us! CLICK HERE to see our other products!!! 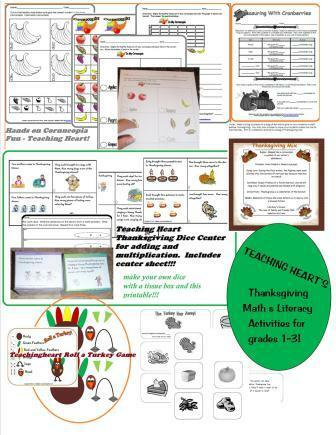 Our Primary Teacher Times Savers October Through January CDROM has even more ideas for Thanksgiving and all the other winter themes in your classroom!!! Pictures of some of the activies in this packet are seen below.